On Friday, punk/new wave legends Blondie released their 11th studio album, Pollinator, featuring contributions from a wide spectrum of collaborators—everyone from Johnny Marr, Dave Sitek and The Strokes’ Nick Valensi to Charli XCX, Sia and Dev Hynes. The range of guests shouldn’t be a surprise to anyone familiar with Blondie’s classic catalog; despite their association with The Ramones, Talking Heads and a specific brand of late-’70s New York rock, Debbie Harry and company have never been bound by genre, expertly blending pop, disco and punk influences, even dabbling in reggae or rap occasionally. So today we pay tribute to their chameleon-like chops by counting down the 10 best Blondie songs. This Autoamerican track from 1980 is perhaps the band’s most polarizing, thanks to Debbie Harry’s rapping. And look, does her flow leave something to be desired? Of course. But we have to commend Blondie for experimenting with what was at the time still a relatively new genre, namechecking hip-hop pioneers like Grandmaster Flash and Fab Five Freddy and, like it or not, giving America its very first No. 1 single featuring rap. 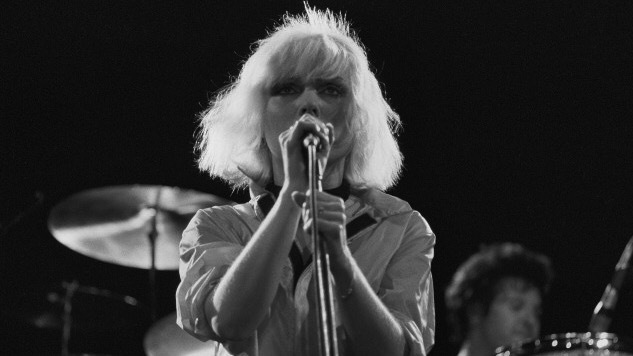 This Parallel Lines track from 1978 is technically a cover (originally recorded by The Nerves in 1976), but Blondie managed to make it their own. At its core is a simple yet highly relatable plea: “Don’t leave me hanging on the telephone,” a sentiment that has managed to outlast several modes of communication, evolving into similar songs like PWR BTTM’s latest single, “Answer My Text.” Phone booths don’t really exist anymore, but the message remains: No one wants to get left hanging. Guitarist Chris Stein penned this Parallel Lines song, and it stands among the band’s best pop efforts. Slick lines like “I know a girl from a lonely street, cold as ice cream but still as sweet” bolster the catchy hook and show the band’s reverence for complicated-but-all-too-familiar teen love stories. Blondie’s cover of this 1966 rocksteady song by Jamaican group The Paragons took on a life of its own. Released as the lead single for 1980’s Autoamerican, its lyrics (“The tide is high but I’m holding on / I’m gonna be your number one”) turned out to be prophetic as it climbed to the top of the charts, giving the band its third No. 1 hit. Like “Rapture,” it’s evidence of Blondie’s total willingness to explore divergent genres—even when it may not make sense on paper. What it lacks in lyrical depth, “Atomic” makes up for with that undeniably great Spaghetti Western guitar riff, elevating what would otherwise be a strong disco track into something timeless, the soundtrack to some sort of post-apocalyptic dance party. “Uh huh, make me tonight” isn’t exactly earth-shattering poetry, but when Harry sings it on “Atomic,” “tonight” suddenly feels like the most important night of your life. Producer Giorgio Moroder teamed up with Blondie for this theme song to the 1980 Richard Gere movie American Gigolo, providing a rough instrumental track and commissioning Harry to fill in the lyrics and melody. Those came naturally, it would seem, as Harry has said the whole process only took a few hours. The rest, as they say, is history, and “Call Me” remains a bonafide dancefloor classic. The ultimate stalker anthem, “One Way or Another” features some of Harry’s strongest vocals and some wonderfully sinister threats like “I will drive by your house, and when the lights are all down, I’ll see who’s around,” and the more overt “one way or another, I’m gonna find ya, I’m gonna getcha, getcha, getcha, getcha.” She got us, of course, and “One Way or Another” stands as one of the best songs—by Blondie or anyone else—of all time. Blondie caught a lot of heat initially for “going disco” with “Heart of Glass”; drummer Clem Burke even refused to play it live at first. And sure, it’s more Studio 54 than CBGB, but it’s also a classic. Disco is long-dead, but “Heart of Glass” persists; if you’ve attended a wedding or a bar mitzvah in the past 39 years, we’re willing to bet you’ve danced to it at some point. And why wouldn’t you? That groove burrows itself deep inside you in a way few others can.